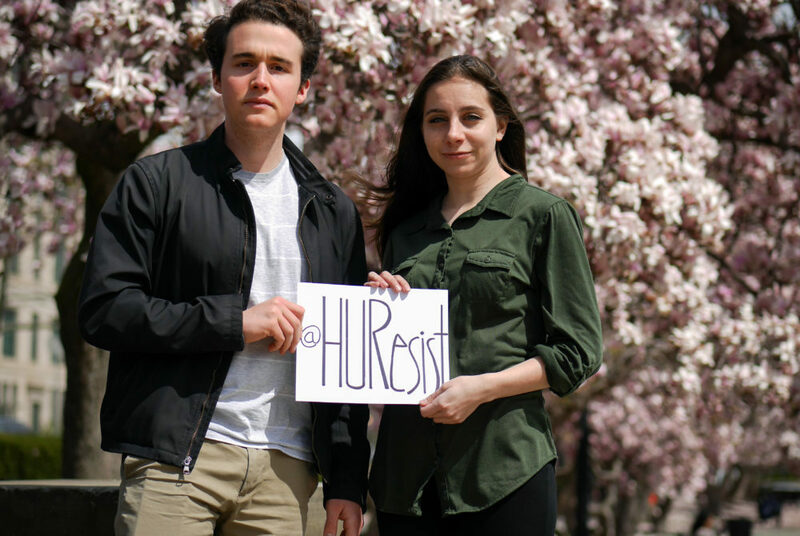 Sophomores Zach Hollander and Eva Raczkowski organized Saturday's event through the Facebook group “Overheard at GW” as a sign of support to Howard activists. Updated: April 6, 2018 at 1:18 p.m.
A group of students at GW are rallying to support the ongoing student sit-in at Howard University, donating blankets, food and water bottles to student activists. The group of five students organized a drop-off event Saturday to aid Howard University students, who have been occupying a central administrative building since March 28 amid a scandal over abuse of financial aid funds. GW organizers said they held the event as an act of solidarity with student activists demanding campus reforms. Sophomores Zach Hollander and Eva Raczkowski organized Saturday’s event through the Facebook group “Overheard at GW” as a sign of support to Howard activists. The group organized students to go to Howard to drop off supplies – including five blankets, three cartons of water bottles, packets of popcorn, granola bars and trail mix – in front of the occupied building. The embezzlement scandal, in which employees were fired after an audit found they had misappropriated financial aid funding, was a “catalyst for an already planned sit-in,” he added. Hollander said the demonstration represented Howard students’ frustration with a range of “persistent issues” at Howard, like the mishandling of financial aid, food insecurity, tuition hikes and the lack of transparency from the Board of Trustees. As the sit-in entered its eighth day Thursday, Hollander said he and a group of other students are hoping to organize another drop-off if the demonstration continues. “If we do another drop-off, we will certainly reach out again to the student body to make sure the awareness is sustained and to garner support if people are able,” he said. HUResist – the student group that organized the sit-in – released a list of nine demands last week including adequate housing for students under 21 years old, the resignation of the university’s president and the disarmament of campus police. Howard has extended the deadline for housing deposits and delayed campus renovations to fit students who requested on-campus housing since the protest began, according to CNN. Members of the Board of Trustees also met with student activists over the weekend in an attempt to end the demonstration. Students at GW did not join the sit-in because only Howard students were allowed inside the building. “The purpose of our drop-off was to show support, not to insert ourselves into their movement,” Raczkowski said. She added that students should support the protest because it encompasses common issues on many campuses – including GW – like high-priced housing, difficulties with financial aid and administrators’ mishandling of sexual assault cases. Andrea Uribe, a junior who participated in the drop-off, said the protest is pushing Howard officials to enact reforms instead of ignoring or punishing students. “Without such an action of sitting in the heart of the school, the administration would have ignored or chastised these students and their demands, as they have done for years beforehand,” she said. The Howard occupation can inspire activists to fight for student rights and financial transparency on GW’s campus as well, Uribe added. Batenga Kiboneka, one of the Howard student organizers of the sit-in, said plans to form HUResist have been in the works since January, but the financial aid scandal was the “last straw” for students. She said there has been a lack of transparency under Howard University President Wayne A.I. Frederick, who began his tenure in 2013, and the students have felt that officials have ignored their concerns since. “We as students need a voice in what goes on at out university and who is making those decisions,” she said. The Hatchet incorrectly spelled Eva Raczkowski’s last name. It is now correct. We regret this error.